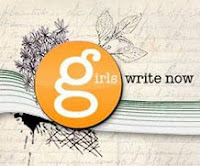 On Saturday morning, Libba Bray and I were the guest speakers at Girls Write Now. Girls Write Now is a nonprofit organization that provides a creative-writing-focused youth mentoring program for girls in New York City. High school students are paired with mentors who are writers, educators, publishing industry professionals, etc. They meet weekly on their own, and then all the mentors and mentees come together once a month for an intensive writing workshop. It's an awesome organization. This month's workshop focused on fantasy (hence Libba and me). We were scheduled to speak in the middle of the workshop, in between writing exercises and discussions -- the ham and cheese in the workshop sandwich. At any rate, it was a great day. I had a blast. And I think the students had fun too. If you're interested in learning more about this wonderful organization, click here to take a look at their website. I'm sure your cheese only added to the presentation. Haha, glad to hear I wasn't the only one with the moving-stuffed-animal fascination/fixation:)Too much TV, I think! Q: I do love cheese. Especially Gouda. Joanna: I'm relieved to hear it's not just me too! As a GWN mentor, I can tell you for a fact that the mentors got at least as much out of your and Libba's talk as the mentees! I especially loved what you said about fantasy bringing wonder to a jaded world -- that got added to my ever-growing list of fabulous quotations. Julie: That's so great to hear! Thanks! !